We've left this set of "post modern" images purposefully ambiguous. For us it expresses ambiguous feelings about our new entrepreneurial venture. FAQ 1: Are these people really standing on old fence posts, or is this just Photoshop trickery? Answer: These are real people (Alison and Andrej are their names) balancing on old fence posts in a swampy area near San Rafael, California. After an hour or so of photo shoot, the police showed up. Three different people driving by had reported suspicious, possibly terrorist-related activity. The police were polite, curious, and rather apologetic. We live in strange times. 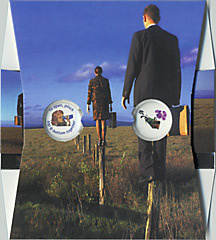 FAQ 2: is this an old Pink Floyd album cover?